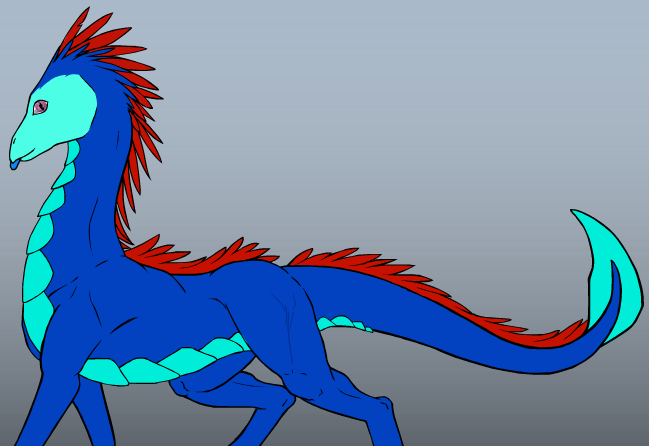 Nueda is a introverted dragon that prefers to hide herself away under water, or in small caves that she can slip into. Rarely does she like to approach anything new, but also tends to open up to anypony that can somehow get close enough to persuade her into talking to them. She prefers to be a pacifist or at the very least avoid the problems that might cause violence. She does enjoy a sweet fruit or two regardless of who gives her it, but is absolutely terrified of Unicorns. Nueda was hatched in a lonesome nest in a unicorn's study hall, she was an assistant of some sort and as such was a helper of sorts, though she never felt comfortable with the unicorn, that received her, around her. Eventually the unicorn started trying to create new spells of some kind and would occasionally attempt to use said new spell upon her. Eventually one of the spells worked, but made Nueda absolutely horrified as her fluffy red mane was withered away before being replaced by many red feathers suddenly sprouting in their place. The spell worked as the unicorn intended in that it forced Nueda to sprout furthers, but not in the correct places. The effects were not an easily hidden thing as they needed to be preened much like a Pegasus' wings, leaving many feathers around the research hall. Eventually the head professor of the hall found out about the unjust actions of attempting new spells on unwilling participants such as Nueda. Shortly after this was found out, Nueda was given the choice to leave the research hall freely and to go where she liked or to stay in the research hall after the student was removed from the hall and told to not return the next day, or within the next few years due to the unjust actions performed by them. Nueda left and began wandering for a fair amount of time before eventually settling around HorseShoe Bay. No picture? That's disappointing. But welcome all the same my friend. I'm glad you could make it. Now there is an image.